How to Train Your Dragon: The Hidden World will arrive in theaters a full three weeks early for special screenings across the country. The saga of Toothless and Hiccup is coming to an end, but not before one last epic adventure unfolds. In addition to the news that eager fans will be able to check out the third installment early, we also have a trio of stunning new posters from legendary artist Drew Struzan. Even those not familiar with the name will surely be familiar with the work of Drew Struzan. The man is credited with more than 150 movie posters, working on iconic franchises such as Indiana Jones, Back to the Future and Star Wars. Some of his notable credits include Blade Runner, The Thing, E.T., Coming to America, First Blood and The Goonies, just to name a few. Now, he's actually come out of retirement to put his stamp on this franchise with three breathtaking posters highlighting the main characters from the series. Struzan's style really suits the fantastical nature of How to Train Your Dragon, as is evident when looking over these one-sheets. As for the early screenings, they're being put on by Fandango and will be taking place across the country on February 2, a full three weeks ahead of the wide theatrical release. This is a strategy that has become increasingly common with big studio releases. Recently, Aquaman and Bumblebee held similar early fan screenings and, in both cases, things turned out quite well. It's also a move that displays a great deal of confidence in the movie, as the studio certainly wouldn't release a less-than-stellar flick three weeks early. 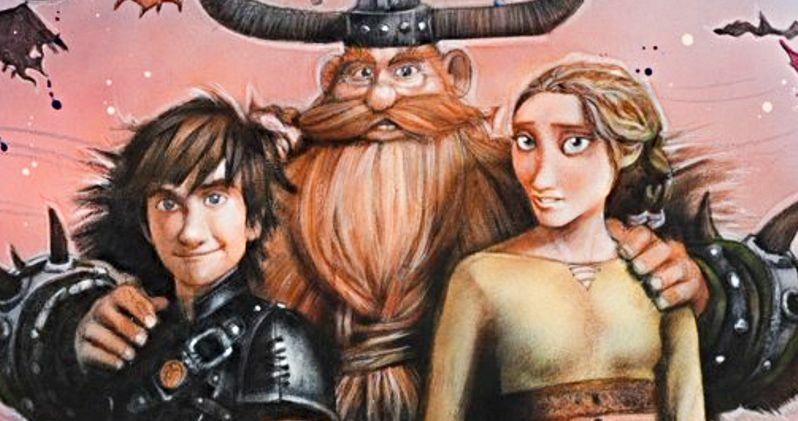 Case in point, while it's very early, How to Train Your Dragon: The Hidden World currently has a perfect 100 percent approval rating on Rotten Tomatoes. The cast includes Jay Baruchel, America Ferrera, Cate Blanchett, Kit Harington, Craig Ferguson and F. Murray Abraham. T.J. Miller, however, will not return, as he's been facing down several different controversies, including various sexual misconduct allegations. Though, based on the early response, it seems as though the franchise is doing just fine without him. How to Train Your Dragon was a major hit for DreamWorks, grossing $495 million worldwide. 2014's How to Train Your Dragon 2 did even better that, taking in $621 million during its run at the box office. With that, hopes are very high for this final chapter. To help promote the early screenings, a video has been released with stars Jay Baruchel and America Ferrera hyping them up, which we have for you to check out below. Also, be sure to check out the trio of new posters from Drew Struzan, which are also conveniently located below. Tickets for the advance How to Train Your Dragon: The Hidden World screenings are available now. For tickets and local showtime information, head on over to Fandango.